France, October, 1904, Robert Esnault Pelterie, a French glider pilot reports using wing warping to maintain transverse equilibrium on gliders is too dangerous. He further stated "It was possible, in our opinion, to cause magnified tension on the wires." 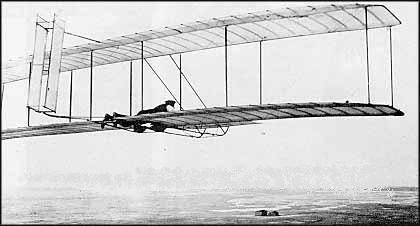 Instead, he has invented a new device comprising of two separate horizontal surfaces which are mounted forward of the wings. The pilot has a hand operated wheel to control them. Used symmetrically, they provide longitudinal stability. Used differentially, they control lateral stability.